Usually dispatched within 2 to 3 days. Ships from and sold by Insten Fulfillment AU. High capacity battery that lasts 2~4 times longer than the standard AA batteries. Save money and protect the environment by using the rechargeable battery. Dock both of your remote and plug it into any USB port. No need to remove the battery. LED light glow from the base of the dock station to show the batteries charging status. Never run out of battery power when you are about to score the winning point. Color: White. Note: Accessory ONLY, Nintendo Wii remote control not included. Works as expected. Red when charging, blue when full. The rechargeable batteries and the cradle I had been using since I bought my Wii way back when it was release finally bit the dust this year and I needed to find a replacement. 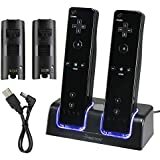 I considered going with a major brand but even today the prices are a bit high on the name brand company Wii remote chargers so I decided to pick up something a little cheaper. 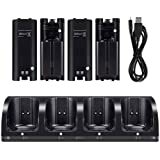 I've been using this charger on my Wii U for about a month or so and most importantly it does its job– with the caveat the remotes have to be placed in their cradle just so. Getting them in so they make contact can be a bit challenging at times. Secondly the device comes with a USB cord to charge that is somewhat short. 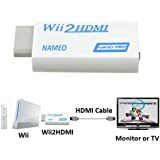 I think the intention is that you should hook it up to the Wii unit to charge which would make sense; however Nintendo has set it so that the Wii does not provide USB power while the console is off. This means that practically speaking you're going to need to provide your own USB power adapter to charge the remotes, and you're going to need to figure out a way to position it in such a way the short cable will still work. Personally, I ended up plugging mine in to my cable box. It had an always on USB for some reason and it's on the same shelf as my Wii U. Overall this is a decent product. It *will* do the job but it won't be elegant, and it won't be effortless. You'll have to figure out how to position the remotes every time you put them in; making sure they are seated or they won't charge. This product was a personal purchase for myself for personal use at the normal retail price. I am reviewing it only because I want to share my experience with other customers. I have not received any compensation for my review nor do I have any relationship with the seller or manufacturer of this product. 86 people found this helpful. 1.0 out of 5 starsBurned!! Bought this in July, and my son said the battery pack itself fell apart!! smelled something burning!! 27 people found this helpful. 5.0 out of 5 starsProduct paid for itself in the first week. 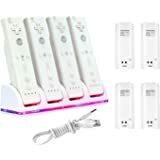 We where tired of purchasing batteries at ridiculous prices for the Wii remotes. It was frustrating and costly. 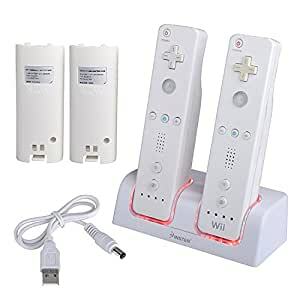 Whenever we need a remote to play there was always an issue as to why we had to dump more and more batteries into them. We got to the point that the game console wasn't being used as often cause of this, and our kiddos where bummed. This was our solution to this problem and boy are we happy with it. This dual charging dock is great in size and doesn't take up much room. The vibrant blue color let's you know your remotes are charged. A red light indicates the remote is charging when placed on the device. It's uncomplicated cradle snuggly holds the remotes in an up right position for charging. Simple enough for my 2 and 4 year old to put the remotes back after use. Battery charges 2 to 4 times longer then the double A batteries. The product paid for its self within the first week of having it. Kids are happy and mom and dad are happy to not be spending money on tons of batteries. 20 people found this helpful. This is SO much better than regular AA batteries or rechargeable AA batteries for Wii controllers. I did not like constantly buying new batteries for the Wii so I tried the Energizer Recharge rechargeable batteries. I don't like being wasteful and they seemed like a better option. The only problem is that they are a slightly lower voltage and they had to be changed daily. So every day we were swapping batteries. 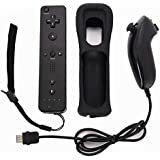 I was looking for lithium batteries for the Wii controllers when I found this. They hold a charge for a good 4-5 days of medium use and charge up quickly. 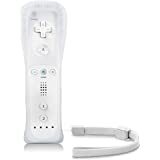 I do have the soft covers on my Wii controllers and you have to remove the covers to charge. This is a much more functional and environmentally sound battery option. 13 people found this helpful. Purchased this product to replace my faithful Energizer charging unit that I had for quite a few years until it finally died. I was hopeful that this unit would do the job. Even though there were negative reviews there were many more positive, so I had my fingers crossed. Unfortunately my experience was unacceptable. Although the unit appeared intact, it was defective right out of the box. First, there were no instructions included with the charger, however my fellow reviewers explained that the lights show red when they are charging and turned blue once charged so I gratefully had that information. Second - When I put the remotes with the new batteries on the charger, the lights showed blue even with lots of futzing with battery placement. No matter how the batteries were placed in the cradle, the color was blue. My remotes were dead though, so I left them in the charger overnight, still hopeful. Third - After charging the batteries for 10 hours, the lights still showed blue and one battery never charged while the other one died after one hour of use. This until is being sent back to Amazon and I will be looking for other options. 7 people found this helpful.